If you're a gadget geek, chances are, your significant other would probably think that you're just as romantic as a trip to their dentist, well, here's the chance to prove your significant other wrong; some gadget gift ideas this Valentine's day to sweep your love one off their feet or boost your chances of getting back together with them. Sure, it's not romantic in itself but show up at her doorstep with a bunch of flowers and stick this LED Name badge on your flowers to double as gift card (don't forget to input a romantic quote but a sweet "i love you will do), be sure to show up at night for extra effect. Surprise her by lighting up her room with a few of these scattered about plus some rose petals. Again, best done at night or when the room is darkened. Looks like the real thing and even turns off when you blow on it. 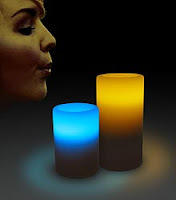 This is a good alternative to the mini mushroom lamp and more romantic. Who doesn't love a puppy and who doesn't own an iPod? 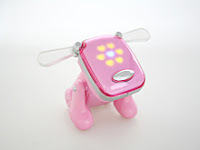 This cute pink dog will dance and act like a speaker when attached to an iPod or an MP3 Player. No woman can resist its cuteness. Why give her real flowers when there's this cute iSmile flower. This is an alternative to the iDOG, hook it up to your iPOD or MP3 player and it plays music as well as dance and lights up in sync with the music streaming on it.